NickLannon.com: Why I Like that RGIII is called "Black Jesus"
Why I Like that RGIII is called "Black Jesus"
I could have called this post "I Literally Couldn't Think of One Original Thing to Say About Manti Te'o," but that seemed a little wordy...and, you know, uninformative. Seriously, though, I just flew in from Chicago and boy are my arms tired! One word, though, about Te'o before we move on. It seems to me that this whole story (a story about which, amazingly, we still don't have all the facts) shines a light on one universal human truth: we will do (or believe) absolutely anything if we feel that we are beloved. I mean, Te'o allegedly flew to Hawaii just to see his (non-existent) girlfriend, and even though she proceeded to only communicated with him via text on that whole trip, he still "wasn't sure" whether or not she existed until a week ago! "She" even, at one point, asked him for his checking account number! However, she also said that she loved him. Who among us wouldn't do anything for such a woman? Now, on to Black Jesus. 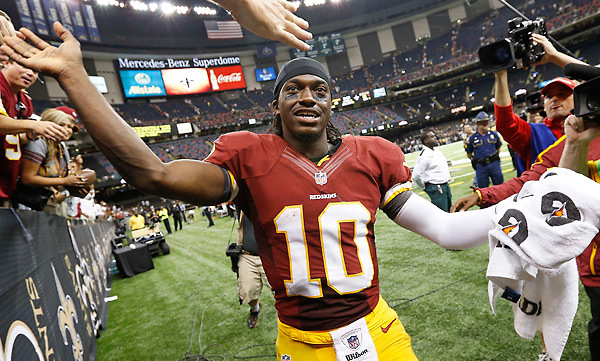 Robert Griffin III is not the first athlete to be dubbed "______ Jesus." Most receive the moniker for their on-field exploits (Larry Bird, the "Basketball Jesus"), although Charlie Whitehurst is called "Clipboard Jesus" more for the look (and for the fact that he never plays). My question is, do we have to wait for Andy Dalton to win a Super Bowl before he's dubbed "Ginger Jesus?" In any event, the appellation rubbed me the wrong way at first, as you might expect. But did you catch Fred Davis' explanation for the nickname (in the above linked article)? "I mean, like I said, he's Black Jesus right now. He saved us today." Whatever hesitation I have about the name of the Christ being invoked so flippantly is mitigated by the fact that the people who are using it are at least thinking in terms of Jesus as a savior. This is rare enough to be remarkable (and important). Normally, for people both Christian and non-, Jesus is nothing more than exemplar of love, care, and charity. He is the classic "great moral teacher" to whom C.S. Lewis refers. Fred Davis, though, is thinking of salvation. Robert Griffin III saved the Redskins, and Jesus saves us. The defense rests: Black Jesus. It's helpful to look at this from the other side. As I've said, most people see Jesus primarily as an example to be followed, in the same way that all of the New England Patriots have adopted coach Bill Belichick's "mum's the word" press conference style. No one, however, has ever been (nor will ever be) moved to refer to Belichick as "Podium Jesus." So let's call Robert Griffin III "Black Jesus." Anything to keep All-of-Creation Jesus' saving work in the front of our minds.